During the March meeting of the Pamlico County Board of Education, Pamlico County Middle School (PCMS) student, Hunter Bennett, and Pamlico County High School (PCHS) student, Kelly Spencer, were recognized as the Oriental Rotary Students of the Month for their school. Each month, this recognition is bestowed upon students who exhibit scholastic achievement, leadership, honesty, community service, teamwork, and empathy, among other notable characteristics. Hunter is a principal’s list student who excels academically. Her teachers describe her as an exemplary student who is hard-working and always strives to do her best. Jeremy Norman, Hunter’s language arts teacher says, “Hunter is extremely diligent about her classwork. She always gives 100 percent. She is also kind and considerate and always has a smile on her face.” Outside of class, Hunter is also manager of the PCMS softball team. Kelly is hard working and dependable. You can always count on Kelly to do her best in class. She cares about her peers and displays the characteristics of a good citizen. Kelly was nominated by her history teacher, Brandi Philipps. Student who are nominated for this award receive a framed certificate and a Rotary coin which states the Rotary Four-Way Test: “Of the things we think, say or do: 1) Is it the TRUTH?, 2) Is it FAIR to all concerned?, 3) Will it build GOODWILL and BETTER FRIENDSHIPS?, and 4) Will it be BENEFICIAL to all concerned?” To further commemorate this honor, the Rotary Club has placed a plaque in both schools which displays the name of each recipient of this prestigious award. 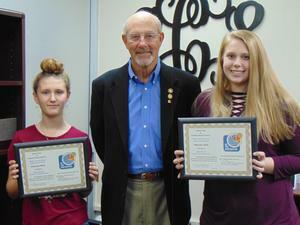 Picture: (left to right) Hunter Bennett, George Steenson, Rotary Representative, and Kelly Spencer.